I’m a Christian lifestyle blogger. I help women experience peace, purpose and joy in order to live a God honoring life. I share practical tips as well as biblical support to help you overcome overwhelm, depression, anxiety and mom burn out. Through Christ, we can find freedom from the lies of the enemy and experience His peace, which transcends human understanding. I didn't realize how limited my mindset was until I experienced a co-worker cussing me out in my office at work. At the time I blamed myself, and not in an empowering way. My inner bully came out and I felt I really had nothing to offer the world. As a Christian for my whole life I knew verses in my head that could help the situation but it wasn't until I spent two years in counseling that I really began to see major mindset shifts in my life. At that point I felt led to create an impact on-line so I started a blog called "Liberating Grace" (that no longer exists.) God led me through a journey that included Beachbody fitness coaching as a network marketer, which taught me the habit of reading personal development books daily. Those mindset shifts were huge and I realized I wanted to share more about that. Particularly how the bible actually gives us the wisdom that I found in secular books. I wanted to give God the credit, not science, not our sub-conscious mind, not humanity. I decided to become a Mindset Coach for Christian women entrepreneurs. I quickly decided to support my clients with business strategy as well because I believe that once we come from the right mindset, action is critical and I didn't want to leave my clients hanging on what action to actually take. I’ve coaching women through diverse struggles including overcoming overwhelm, making big decisions, building confidence, biblical money mindset and staying aligned with God’s will vs. the pressure and expectations we (or the world) places on us. In pursuing this I created a fantastic facebook group that is mostly filled with faith filled entrepreneurs but I opened it up to all Christian women. I'm a wife and a stay-at-home mom of two young girls with girlie #3 expected in August 2019 . It was not originally our plan for me to be at home and another journey God has been taking me through is accepting my role as a wife, mother and homemaker (my least favorite part!). Despite my resistance, God is teaching me to step aside to allow my husband to step up as the provider while I focus on serving him and my kids in the home. He taught me what He wanted to from my past businesses and now with a surprise baby on the way He confirmed this is not the right season for that. While I am no longer coaching, I still feel called to share the lessons I’m learning with others online and that is where this blog comes in. I’ll mostly focus on things like motherhood, common emotional struggles for women, fertility, pregnancy, wife challenges, biblical womanhood and stuff like that. Those will fit under the faith, family and female stuff categories. However, I’ll sprinkle in a little finances and fitness as well. I’d love to stay connected. Since I love to treat my friends well, I have a bonus treat for you if you want to join my Courageous Christ Follower email list. Not only will you receive biblical encouragement, insight and inspiration to your inbox about once a month but you will ALSO receive my Spiritual Growth Guide. 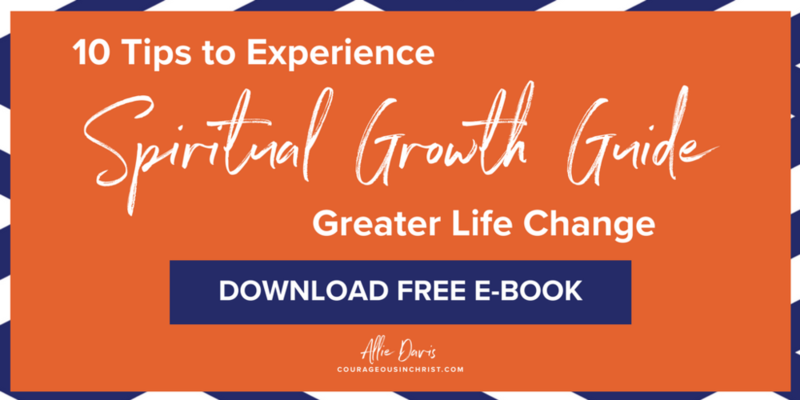 This guide includes 10 tips to experience greater life change through whatever you do to grow spiritually. It's easy to check things off a box, but taking that head knowledge into your heart and living differently...that's how you get lit up for Jesus!